Descriptors: Parkinson's disease, mild cognitive impairment, cognitive impairment, Montreal Cognitive Assessment.  Descritores: doença de Parkinson, comprometimento cognitivo leve, comprometimento cognitivo, Montreal Cognitive Assessment. Vários testes de triagem foram utilizados para avaliação cognitiva na doença de Parkinson (DP). OBJETIVO: Avaliar a utilidade da Avaliação Cognitiva de Montreal (MoCA) em pacientes com doença de Parkinson sem queixa de comprometimento cognitivo. MÉTODOS: Um total de 40 pacientes com TP sem queixas de problemas cognitivos foram admitidos e com o Estado de Exame do Estado Mental Mini (MEEM) foram selecionados e receberam o MoCA. RESULTADOS: 80% apresentaram dados de Comprometimento Cognitivo Leve (ICM) segundo o MoCA, sendo as funções visoespaciais, atenção e memória atrasada aquelas que apresentaram diferenças estatisticamente significantes entre os grupos MoCA normal e anormal. CONCLUSÃO: Este estudo sugere que o MoCA pode ser um bom teste de triagem em pacientes com DP que não apresentam queixas cognitivas. Parkinson's disease (PD) is the second most common neurodegenerative disease after Alzheimer's disease (AD). As many as 20-30% of patients with Parkinson's disease (PD) have cognitive deficits within the range of Mild Cognitive Impairment (MCI) at the time of diagnosis, a condition that is very important to detect since it is associated with an increased risk of developing dementia.1,2 The typical profile of cognitive impairment in PD involves impairment in executive functions, attention, visuospatial and subcortical memory functions, recall, language preservation, and praxis.3,4 Given this scenario, it is important to screen patients with PD because of the risk of developing dementia associated with PD (PDD). Currently, several screening tests have been recommended for the evaluation of cognitive impairment in PD, such as the Scale for Outcomes of Parkinson's Disease Cognition (SCOPA-COG), Mini-Mental Parkinson (MMP), Parkinson Neuropsychometric Dementia Assessment (PANDA), Parkinson Disease Dementia-Short Screen (PDD-Short Screen) and the Montreal Cognitive Assessment (MoCA).5 This last test was originally designed for the evaluation of mild cognitive impairment associated with AD, and evaluates memory, executive functions and verbal fluency among others, and can be applied in a short period of time. It has been used for the cognitive evaluation of the patients with PD to identify the presence of cognitive deficit when the MMSE score is normal. This test has a maximum value of 30 points and can be administered in 10 minutes. At least four studies have been conducted demonstrating that the MoCA in patients with PD is sensitive to small cognitive changes. 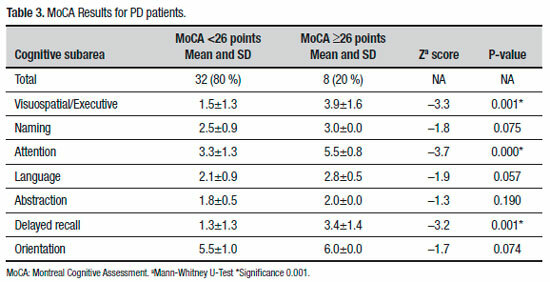 The MoCA has shown a good test-retest effect, low inter-evaluator variability, sensitivity of 82% and specificity of 75% with respect to neuropsychological tests for detecting MCI and Dementia using a 26-point cut-off.6,7 MoCA has proven the most suitable instrument for screening Mild Cognitive Impairment in PD (PD-MCI) and PDD in clinical trials according to the Parkinson Study Group (PSG) Cognitive/Psychiatric Working Group. The objective of this research was to evaluate the usefulness of the MoCA in the detection of cognitive impairment in PD patients without cognitive complaint and with normal MMSE score. A total of 40 PD patients were selected from Neurology outpatient consultations at the National Hospital of Geriatrics and Gerontology. Disease diagnosis was according to the criteria of the United Kingdom Parkinson's Disease Society Brain Bank Diagnostic Criteria for Parkinson's Disease. Patients with disease duration <10 years, no cognitive complaints and an MMSE8,9 score ≥24 points were included. During a 12-month period, all patients underwent a complete anamnesis, a neuroimaging study consisting of Computed Axial Tomography scan, general biochemistry workup consisting of hemogram, renal function, electrolytes, renal and hepatic function tests, thyroid function, VDRL (Venereal disease research laboratory), levels of B12 vitamin and folic acid, in order to exclude other causes that might explain the cognitive deterioration. In addition, participants completed the Clock Drawing Test (scored according to Cacho et al. ),10,11 Barthel's Scale of Activities of Daily Living12 ( BADL), Lawton's Scale of Instrumental Activities of Daily Living12 (IADL), the Yesavage Geriatric Depression Scale13 (GDS) 15-point version, the Hoehn and Yahr scale,14,15 as well as the MoCA test. Cases with a previous diagnosis of mild cognitive impairment, dementia, or psychiatric illness including depression, an advanced medical condition or severe sensory deficit were excluded. In all cases, the different scales were applied by the same evaluator, trained in the use of all the tests, in order to standardize the evaluation. Basic sociodemographic information was also collected. The study was approved by the Local Scientific Ethics Committee (CLOBI) under number 03-2014. Statistical analysis was performed using the statistical program Stata 13.0 SE (StataCorp. LP 2013). The presence of normal cognition was defined for scores ≥26 points on the MoCA and cognitive impairment as score <26, as determined for the general population. The comparison between the groups with and without cognitive impairment was performed using the Mann-Whitney U-Test. Among the total cases, females predominated (55%), while average age and formal education were 76.6±6.6 and 7.4±5.3 years, respectively. The mean duration of the disease was 5.5±3.2 years and 85% used Levodopa as part of their baseline therapy (Table 1). In terms of level of functioning, 65% were at initial functional stages according to the Hoehn and Yahr scale, exhibiting slight repercussions on the BADL and the IADL scales, and had low risk of depression (Table 2). Regarding cognitive aspects, the average score obtained on the MMSE was 26.7 and on the Clock Drawing Test was 6.8 points. The mean value on the MoCA was 20.7 points, proving abnormal (score <26) in 80% of the cases (Tables 2 and 3). For the different MoCA sub areas, statistically significant differences in visuospatial, attention and delayed recall functions were evident between the normal and abnormal MoCA groups (Table 3). In conclusion, patients with PD can present cognitive impairment even when not perceived by the patients. The use of cognitive tests with greater sensitivity and specificity is required to detect these deficits and the MoCA represents a good alternative for this purpose. Authors contributions. Krisly Arguedas Vásquez: planned, organized and supervised the project, Erick Miranda Valverde: wrote, edited and supervised the manuscript, Daniel Valerio Aguilar: carried out the study and wrote the manuscript, Henri-Jacques Hernández Gabarain: organized and carried out the study. 1. Janvin C, Aarsland D, Larsen JP, Hugdahl K. Neuropsychological profile of patients with Parkinson's disease without dementia. Dement Geriatr Cogn Disord. 2003;15(3):126-31. 2. Emre M, Aarsland D, Brown R, Burn DJ, Duyckaerts C, Mizuno Y, et al. Clinical diagnostic criteria for dementia associated with Parkinson's disease. Mov Disord. 2007;22(12):689-707. 3. 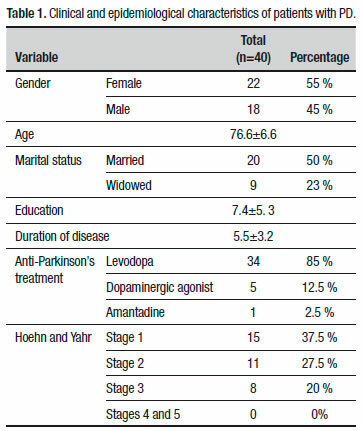 Muslimovic D, Post B, Speelman JD, Schmand B. Cognitive profile of patients with newly diagnosed Parkinson disease. Neurology. 2005; 65(8):1239-45. 4. Dalrymple-Alford JC, Livingston L, MacAskill MR, Graham C, Melzer TR, Porter RJ, et al. Characterizing Mild Cognitive Impairment in Parkinson's Disease. Mov Disord. 2011;26(4):629-36. 5. Biundo R, Weis L, Pilleri M, Facchini S, Formento-Dojot P, Vallelunga A, Antonini A. Diagnostic and screening power of neuropsychological testing in detecting mild cognitive impairment in Parkinson's disease. J Neural Transm. (Vienna) 2013;120(4):627-33. 6. Nasreddine ZS, Phillips NA, Bédirian V, Charbonneau S, Whitehead V, Collin I, et al. The Montreal Cognitive Assessment, MoCA: A Brief Screening Tool For Mild Cognitive Impairment. J Am Geriatr Soc. 2005; 53(4):695-9. 7. Chou KL, Amick MM, Brandt J, Camicioli R, Frei K, Gitelman D, et al. A Recommended Scale for Cognitive Screening in Clinical Trials of Parkinson's Disease. Mov Disord. 2010;25(15):2501-7. 8. Folstein M, Folstein S, Mchugh P. "Mini Mental State Examination'' a practical method for grading the cognitive state of patient for clinicians. J Psychiat Res. 1975;12(3):189-98. 9. Ridha B, Rossor M. The Mini Mental State Examination. Practical Neurology. 2005;5:298-303. 10. Cacho J, García-García R, Arcaya J, Vicente JL, Lantada N. Una propuesta de aplicación y puntuación del test del reloj en la enfermedad de Alzheimer. Rev Neurol. 1999;28(7):648-55. 11. Juby A, Tench Sh, Baker V. The value of clock drawing in identifying executive cognitive dysfunction in people with a normal Mini-Mental State Examination score. CMAJ. 2012;167(8):859-64. 12. Trigás-Ferrin M, Ferreira-González L, Meijide-Míguez H. Scales for functional assessment of the elderly. Galicia Clin.. 2011;72:11-16. 13. Yesavage JA, Brink TL, Rose TL. Development and validation of a geriatric depression screening scale: a preliminary report. J Psychiatr Res. 1983;17(1):37-49. 16. Nazem S, Siderowf AD, Duda JE, Have TT, Colcher A, Horn SS, et al. Montreal Cognitive Assessment Performance in Patients with Parkinson's Disease with ''Normal'' Global Cognition According to Mini-Mental State Examination Score. J Am Geriatr Soc. 2009;57(2):304-8. 17. Camargo CHF, Tolentino ES, Bronzini A, Ladeira MA, Lima R, Schultz-Pereira GL, Young-Blood MR. Comparison of the use of screening tools for evaluating cognitive impairment in patients with Parkinson's disease. Dement Neuropsychol. 2016;10(4):344-50. 18. Han-Yeong Jeong, Jee-Young Lee, Hee Kyung Park, et al. Clock drawing test to screen for dementia in parkinsonian patients with low educational backgrounds. Neurology Asia. 2016;21(4):357-65. 19. Saka E, Elibol B. Enhanced cued recall and clock drawing test performances differ in Parkinson's and Alzheimer's disease-related cognitive dysfunction. Parkinsonism Relat Disord. 2009;15(9):688-91. 20. Hoops S, Nazem S, Siderowf AD, Duda JE, Xie SX, Stern MB, Weintraub D. Validity of the MoCA and MMSE in the detection of MCI and dementia in Parkinson disease. Neurology. 2009;73(21):1738-45. This study was conducted at the Hospital Carlos Luis Valverde Vega, Caja Costarricense de Seguro Social, Alajuela, Costa Rica.